This year our harvest took place incredibly early--September 14--in the middle of the night. Unfortunately, Ed and I slept through it as our harvesters arrived before 4 am. We did, however, go to Jessep Cellars later in the day (where our wine is made), to watch our grapes be de-stemmed. 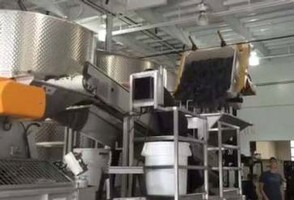 The process was so interesting as the fork lift grabbed each bin of grapes, lifted them and dumped them in another vat to be manually sorted and then carried along on a mechanized belt to be separated into stems and berries. The harvest was a bit smaller than we'd hoped, and we heard all the harvests were smaller this year. However, the good news is that the berries are delicious! Ed and I were lucky enough to see my most favorite jazz singer--Diana Krall--at the Hollywood Bowl, where she gave a sensational concert. We had seen her in concert at least three times before, but each time she has been more amazing than before. She played the piano while singing hits from the Great American Songbook and captivated the audience. It is amazing that she started out just as a jazz pianist, not as a vocalist, but was overheard singing by her manager, who encouraged her to sing as part of her repertoire. I went home a happy camper after having seen her that night. After Ed and I attended a wedding in the Mt. Hood area outside of Portland, we made a wine tasting tour of the Willamette Valley, mostly around the town of Newberg. 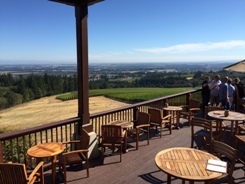 Some of our favorite wines we discovered were Ken Wright Cellars 2012 Yamhill-Carlton District Pinot Noir; Dobbes Pinot Noir; Chehalem Pinot Noir and Chehalem Ian Chardonnay. This Chardonnay was all the more special since it has the name of our almost- three-year-old grandson Ian. We stayed at the lovely Allison Inn and Spa in Newberg. We also managed to do some hiking and exploring in Oregon and got to see the beautiful Multnomah Falls when we weren't wine tasting--other healthy alternatives to red wine!